Cozy Damascus, Virginia Cabin located near the Virginia Creeper Trail! 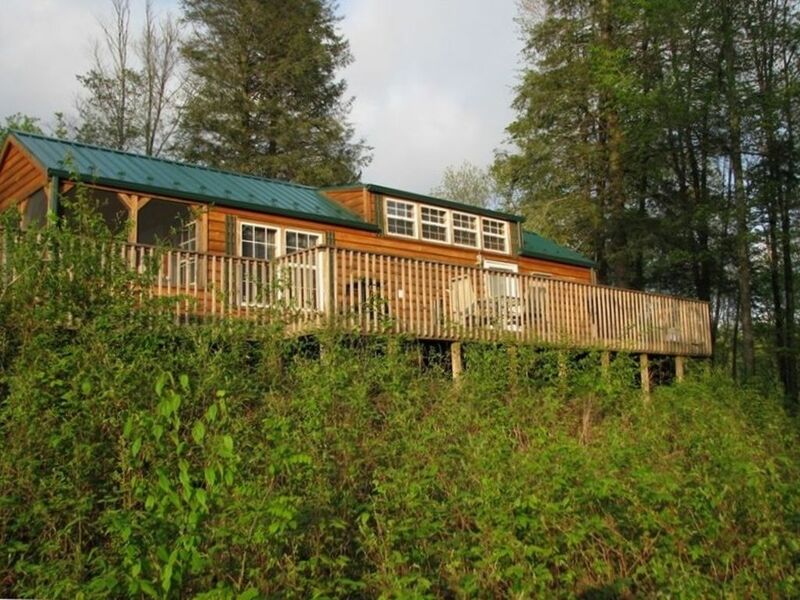 Located near the Virginia Creeper Trail and Appalachian Trail, guests are sure to enjoy a memorable vacation in this fully furnished, 1 bedroom/1 bath cabin. The main/master bedroom has a queen-sized bed. The living room is furnished with a huge, comfortable couch and a fireplace. The kitchen is perfect for dining as it is equipped with a stove and microwave. There is also ample space outside the cabin to pitch a tent or two if you are interested in having a taste of true camping! Please note that the cabin is a 400 square foot "Tiny Home". Our cabin is 15 miles east of Damascus, Va. and minutes away from the Virginia Creeper Trail and the Appalachian Trail. Activities nearby are perfect for people that love the outdoors! Gas fireplace in main room of cabin. We very much enjoyed our stay at Deer Run. After having my Pancake Breakfast at the maple festival on Sunday, I drove up to the peak of White Top just around the corner for what was truly unique experience of alternating clouds and sunshine with eddies of dirt devil like swirls of ice crystals dropping down from the clouds. I had to make myself leave, it was so exciting. My wife is looking forward to returning to the cabin. Dear Run Cabin was a sweet place to stay. Although only 400 sq ft, it seemed as large as the 900 sq ft place we stayed previous to this. The space is really well used. We were here in March, and the weather was cold so using the outside space and screened in room were impractical for us, but would be excellent in warmer weather. We did some hiking with our German Shepherd who loved the seclusion. I would recommend this cabin if staying in the area. Thank you Mary Lynn- we are glad the cabin was a great place to stay for you, and that you were able to get some hiking in. Come back in again in warmer weather! We stayed here a couple of days to day hikes in the area. Very nice and convenient to Mt. Rogers. Thank you William- glad you enjoyed stay and time at Mt. Rogers! We enjoyed our stay in this cozy little cabin. There was everything we could ask for and a comfortable bed to snuggle into. It was cold out but we were toasty and warm inside. Took several walks up the hills behind the cabin and several along the beautiful Creeper trail. We marveled at the effort it must have taken to build that rail bed so long ago. Thank y’all for a wonderful stay. Thank you Debbie- we are glad you found the cabin to be a cozy getaway and got to explore the Creeper Trail! This cabin is adorable and cozy! My boyfriend, our two dogs, and I had a fantastic time. We were fortunate enough to get a couple inches of snow too! Cabin has everything you need for the perfect peaceful getaway. We especially enjoyed the small heaters that are directed towards the floors in the bedroom and bathroom... keeps you nice and toasty when you’re getting out of the shower or just crawling out of bed. Plus there is a terrific little store just a couple miles down the Mountain; very convenient and they make the best hot prepared foods! You will not be disappointed when you book this mountainside retreat! Thank you Angela- we are glad you had a great getaway and got to enjoy the snow! Come back soon! The cabin was very cute and very, very clean. We were so impressed by the large deck outside. We had to leave early due to a winter storm coming that way with freezing temperatures and the owner and property manager were very understanding. We will definitely rent this cabin again and pay better attention to the weather report next time! Thank you Mahri- we are sorry your trip was cut short by winter weather! We hope you come back soon! Located on the southwest side of Whitetop mountain, the second highest peak in Virginia, 15 miles from the famous Appalachian Tail town of Damascus, VA. The property is a five minute bike ride to the renowned Virginia Creeper bike rail trail. Ten minutes away by car are trailheads for accessing the Appalachian trail, one on the top of Whitetop mountain off of route 600, the other around the corner on route 601. Trout fishing is available on Green Cove Creek and the famed Whitetop Laurel River which run along the Virginia Creeper Trail.